Welcome to the K-State Olathe Horticulture Center's quarterly newsletterTo read each article, just click on the + symbol to the right of the headline. If you prefer a printable copy of the newsletter, click HERE for a pdf of this edition. In July, 2018 I moved to Lenexa to begin work at the Olathe Horticulture Research and Extension Center. This is after spending the last forty years on some type of campus, defined by Webster’s as “a university, college, or school viewed as an academic, social, or spiritual entity.” K-State is definitely an academic and social entity, and there’s something spiritual about it, too. The Wabash Cannonball and all that it represents works its way into your soul and doesn’t leave. I will continue to maintain a close connection to all that the campus has to offer. The move was my choice, and I’m grateful to the K-State administrators and my colleagues within the department for helping make it happen. I grew up in the Kansas City area, but haven’t lived here for over 40 years. Why move? Change. Not total change in this case, but partial change. I wake up in a different house in a different city, drive to a different office location, work among a different group of people, focus on a different piece of land for research, and buy season tickets for a different sport played at a major league level. I’m fortunate that I’ve still got a lot of things that stayed the same – a supportive family; a fantastic university; great colleagues in turf, including Christy, Cliff, Ward, Steve, Dale, Megan, Jared, Cathie, Ray, and Mark; and the supportive, statewide Kansas turf industry. Nathalie, my wife of 31 years (how have you put up with me for so long? ), and I now live within a short drive of two of our children and their spouses, and a new grandson. Yes, he has a Mahome’s jersey and is doing the Wabash Cannonball “back and forth” before he can crawl. We left our youngest daughter in Manhattan absorb all the benefits of CAMPUS life. What do I do in Olathe? Well, technology today allows me to continue teaching students on CAMPUS. I use a combination of online teaching with periodic in-person contact to accomplish this. At present, I teach an advanced turf course, and a turf disease management course. An advantage of being in the Kansas City area is that I’m close to a lot of K-State turf program alumni and I will be able include them in classes. I will conclude each lecture-based assignment with an interview with an industry professional, many of whom are K-State turf alumni. They talk about how field problems are dealt with in the real world, and also discuss the career path that led each to the position their in today. It’s important to bring practical, real-world examples back to students on the CAMPUS. In Olathe, my colleagues secured funding for sealing a pond that has been leaking water for over 20 years. Having a consistent source of water in the future will be wonderful. Last fall, we established a large tall fescue trial as part of the National Turfgrass Evaluation Program. There are over 120 new cultivars in this trial – wow 9 (See Fig. 1)! Just like Rocky Ford and the John C. Pair Center in Wichita, we at Olathe will be reaching out for support from the industry. 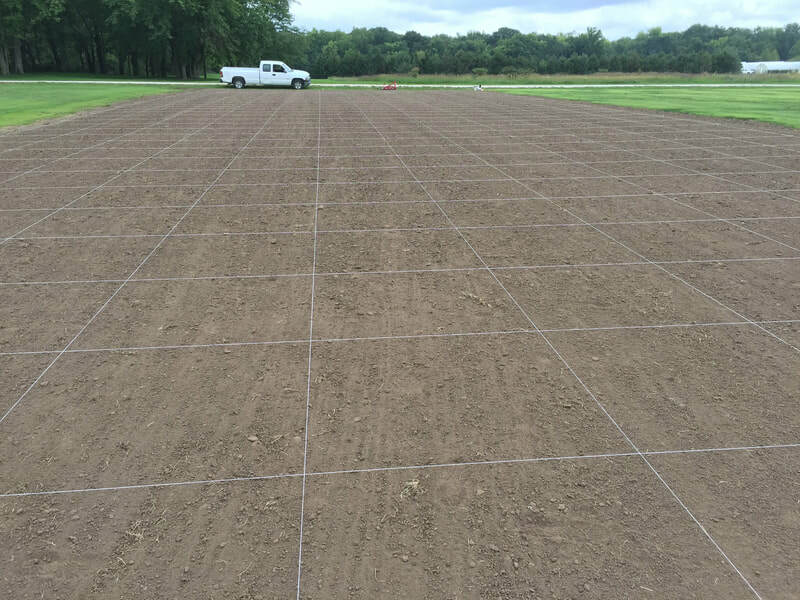 Without the continued support from the KTF, KGCSA, HAGCSA, GCSAA, and USGA, and industry, expansion of turf research at Olathe wouldn’t be possible. We’re going to need donations to complement this financial support, and you will be hearing from us. Mark your calendar for Thursday, August 1 when we’ll host the Kansas Turfgrass Field Day in Olathe. Not only will it be educational, we’ll make it fun! If your company has interest in helping sponsor this event, reach out to me. I’ve included my new address and phone number below – I no longer have a phone on CAMPUS. My email hasn’t changed. I look forward to hearing from many of you in 2019. L to R: A new tall fescue trial was established at the Center last September. (left photo) Nearly 1,000 genetically different zoysiagrasses were planted at the Olathe Horticulture Research and Extension Center in July, 2018 (right photo). 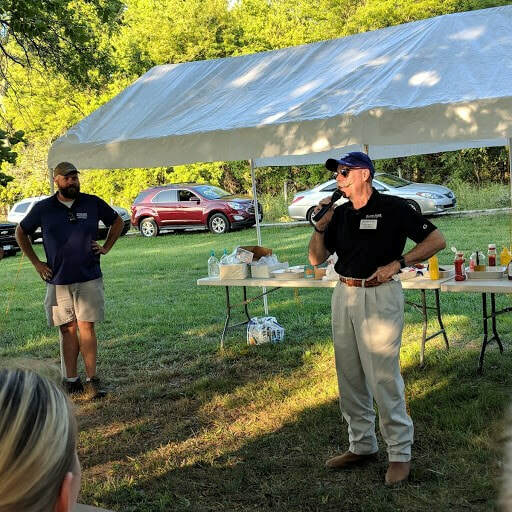 OHREC's 2018 Commercial Vegetable Research Field Day drew a crowd of nearly 80 vegetable producers to the Olathe Horticulter Center to see current research projects in progress and hear reports from the students and faculty. Highlighting the event was a visit from Interim Dean of the College of Agriculture Ernie Minton (center photo below). Attendees heard updates about tomato grafting & rootstock trials, cover cropping in hoop houses, postharvest handling of sweet potato slips, and impact of light on lettuce and tomato growth. The field day was also an opportunity to introduce the new equipment at OHREC, including the moveable high tunnel from Rimol, packing shed for washing and sorting, and mobile cooler. Extension Master Gardeners were available to share information about their Backyard Demonstration Garden. Following the research updates everyone enjoyed a hamburger cookout with fixins. Final activity for the evening was the presentation of graduation certificates to Growing Growers Apprentices. 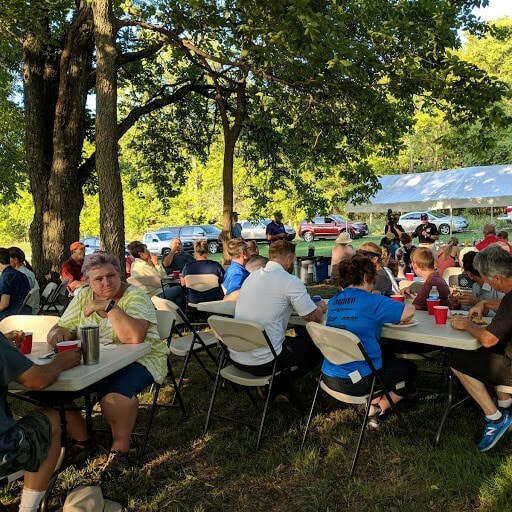 Above L to R: Participants enjoyed a Hamburger Cookout following the Commercial Vegetable Field Day. Dr. Ernie Minton, Interim Dean of K-State's College of Agriculture, addresses the crowd. Zac Hoppenstedt (l ) presents a graduation certificate to one of the Growing Growers graduates. ​Research conducted by Kelly Gude, doctoral student, and Zac Hoppenstedt, former master’s student, was featured in the Fall 2018 edition of Seek magazine, K-State’s quarterly research publication. The article entitled “The Making of a Meal” features Gude's work on yield and nutritional quality of tomatoes and leaf lettuce grown in high tunnels in the segment “The Toppings” (page 24) and Hoppenstedt’s research on sweet potato slip production in “The Sides” (page 25). d​Graduate students from K-State Olathe and OHREC had a strong presence at the 2019 Great Plains Growers Conference, January 11-12 in St. Joseph, MO. Carly Estes, Tricia Jenkins, and Joe Rundquist participated in the poster session. A Research Roundup breakout session featured presentations from graduate students Kelly Gude, “Light Effects During Pre- and Postharvest Stages to Improve Nutrition of High Tunnel Vegetables,” Ashlee Skinner, “Ecological Study: Monitoring Belowground Arthropods,” Konstantinos Batziakas, “Meeting Consumers Needs With Locally Produced Spinach,” and former graduate student Zac Hoppenstedt. Students also assisted with Willie and the Salad Bonanza at K-State Olathe on November 3. 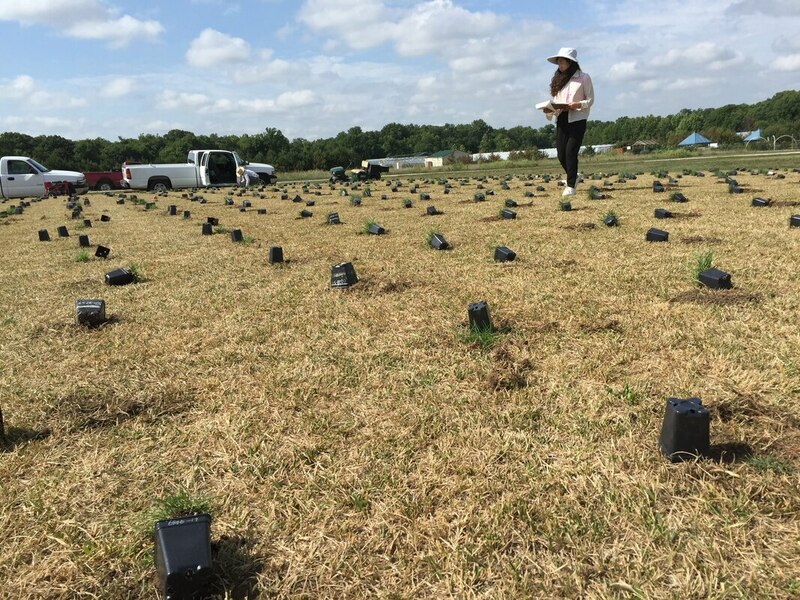 Graduate students Tricia Jenkins and Joe Rundquist measured biomass of salad greens grown for the competition. Undergraduate Cassidy Fleck and graduate students Carly Estes and Tricia Jenkins staffed a table with recruiting information for the Horticulture and Natural Resources Department. 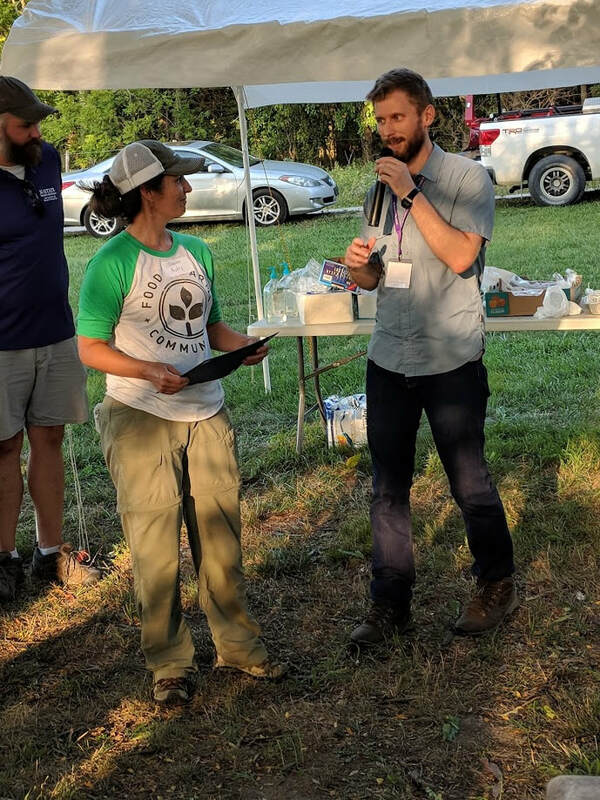 AshleeSkinner, grad student, conducts research with growers at 2019 GPGC. Tricia Jenkins, grad student, poster exhibit at 2019 GPGC. Joe Rundquist, grad student, poster exhibit at 2019 GPGC. Carly Estes, grad student, poster exhibit at 2019 GPGC. Konstantinos Batziakas, graduate student, works the poster session at 2018 Willie and the Salad Bonanza. ​at 2018 Willie and the Salad Bonanza. ​OHREC donated 8,787 pounds of tomatoes, peppers, spinach, and lettuce to After the Harvest from the 2018 growing season. Donated vegetables are from research projects conduct at the center. After the Harvest rescues nutritious fruits and vegetables from going to waste and donates them to agencies that serve hungry people, primarily in Greater Kansas City. After the Harvest, a 501(c)(3) nonprofit, is the largest produce donor to Harvesters—The Community Food Network.